Confession time – I’ve been eating quick oats lately. The kind of oats that come in a cylinder and take all of two minutes to nuke in the microwave. They’re basically the weakling runts of the oat world, with steel-cut oats and oat groats being the powerhouses that pack a fantastic nutritional punch. And even though I do have a bag of steel-cut oats in my [mostly bare] cupboard, I’ve been grabbing the quick oats when I feel like being grainy for breakfast. I think I have an excuse, though. My mom and I bought them a couple of weeks ago when she was here helping me move into my apartment; we were staying in an extended stay hotel with a kitchenette, and we thought it’d be prudent to invest in some breakfast foods. Quick oats were the perfect solution; we’d get up in the morning, make oatmeal, and then head out for a day of furniture-shopping and bed-putting-together. After she left, I still had 3/4 of a container of quick oats, so that’s been my fall-back option when I want a quick breakfast. Since I’m not really willing to expend 20 minutes making steel-cut oats in the morning before work, I appreciate the minimal time investment. I still feel a little guilty, though. But a few days ago, I discovered a way to dress up my oats for the holidays, and ever since, I’ve ben unabashedly unashamed of my breakfast. It’s so simple, too. I’ve always been a fan of making oats with soy or almond milk, since I think watery oats are pretty much the most disgusting thing ever. They taste thin and generally disgusting, in my opinion. But if you make oatmeal with milk, it instantly turns into a delicious, creamy breakfast, even if you don’t have an immersion blender for that added touch of creaminess (I don’t have one of my own at my apartment, boo). So I’ve always been a soymilk and oatmeal fan. 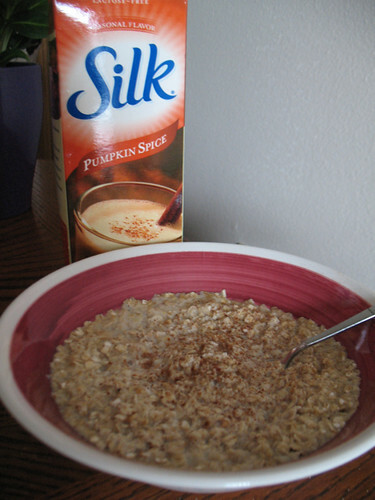 The other day, though, I decided to add some of Silk’s seasonal Pumpkin Spice flavor to my oats. I couldn’t decide if I was wasting the precious drink by putting it in oatmeal, but I decided to give it a shot. And, oh, am I glad I did. The result is a creamy, subtly flavorful oatmeal that requires little to no additional sweeteners. It’s seriously amazing, especially with an extra dash of cinnamon on top. I am so very glad I decided to give this a try. I’m already thinking of what else I could do with this discovery. Chocolate Peppermint Stick Oatmeal, using WestSoy’s amazing holiday beverage? Nog Oats spiced with nutmeg?! What do you think – any great oaty ideas?